The Phi Phi Island tour takes in the matchless beauty of Koh Phi Phi. The islands are dominated by limestone cliff panoramas, deep aquamarine seas and coral reefs that hug the coast. No wonder Phi Phi Island tours are a magnet for all the people staying on the island or on the neighbouring holiday destinations. Phi Phi Island tours start at the main pier in Phi Phi Don Village. This new and all purpose pier receives all the ferries from Phuket, Krabi, Koh Lanta as well as dive boats, tour boats and the ubiquitous longtail boat. The striking and significant scenery of Koh Phi Phi are the cliffs of Koh Phi Phi Ley, Phi Phi Don, Bamboo and Mosquito Island and the beaches that have views of this. The headline sightseeing tour of Maya Bay on Koh Phi Ph Ley can be organised by longtail boat or big boat and often includes snorkeling. (This is the point where the 'The Beach' was recorded where Leonardo Di Caprio played the lead role.) This can be done at any time of the day light hours but I prefer the packaged Sunset tour of Phi Phi Ley which at 590 THB is astounding value. A converted fishing boat makes the perfect platform from which to admire the majesty of the island and maybe get off a few pictures of the glorious sunset to boot. 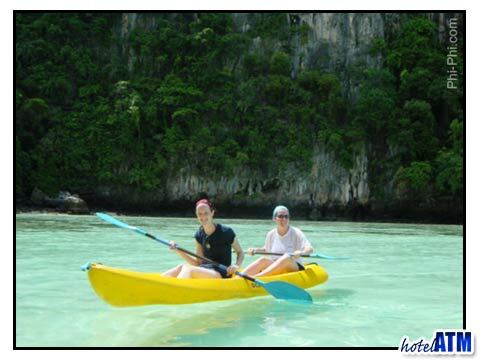 Koh Phi Phi Ley Phi Phi Island tour by speedboat can be done at a half day or full day. The speed and rush of air appeals to a differing kind of character and these tours include swimming, snorkeling and sightseeing and a good deal of beach time. 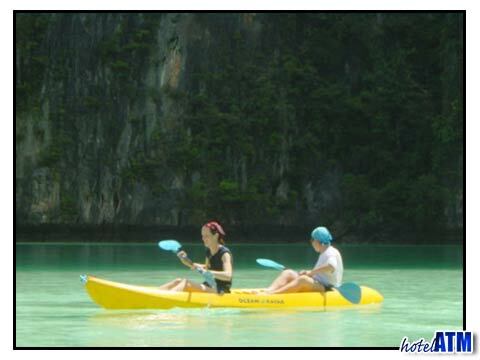 The Phi Phi Island tour from Phuket is fashionable at the moment. A beautiful cruise out from Rasada Pier pulls together the magic of the sea and the expectation of adventure. The One Day Tour Phi Phi and Maya Bay by Sea Angel cruise ship takes you on a spacious large boat out of Phuket town towards Maiton Island. As you reach the first promontory you see a landscape transformed by islands and inlets and the Koh Phi Phi islands full ahead. The tour takes you to Phi Phi Don and Phi Phi Ley, provides lunch and snorkeling stops. You can arrange a Phi Phi Island tour by speedboat from Phuket and they leave from the Boat Lagoon or Royal Phuket Marina. These fast and exciting tours get you to the beaches, quickly and in style so you have the maximum time to work on that tan, take a stroll on Maya Bay or check out the coral gardens by snorkel. These tours are popular as well. The Phi Phi Island tour from Krabi shows Koh Phi Phi from a different light again. If you are staying on the beautiful Ao Nang Beach you will get some intriguing glimpses of Bamboo Island and Koh Phi Phi Don. Krabi is equally famous for it's cliff vistas, islands and jungle scenery however it doesn’t have the clear and clean waters of Koh Phi Phi, not the extensive 20 km of coral reef. This is why many take the daily cruise boat at 08.30 out to the islands and why it has its appeal.